While project planning, a plan assessment on the existing field conditions is a crucial first step. Precision Pipeline, Inc.’s staff is prepared to provide useful design build information to the engineer designing your project. Our local experience and knowledge of city and state specifications helps to build your project successfully. For pipeline projects, a review takes place in the field by Precision Pipeline, Inc. personnel to familiarize our team with the area associated with the project. 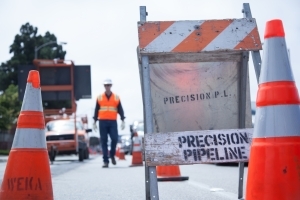 Most importantly, it provides an opportunity for observation that can often identify unknown physical features and unidentified structures that can have a direct impact on the proposed pipe alignment. Price competitive engineering provided by Precision Pipeline, Inc. can keep cost and schedule impacts for your project to a minimum. A review of current land values will identify important differentiation within unique markets. Identification of topographical and environmental features will highlight floodplains, wetlands as well as any archaeological, cultural, and historical sites. All of these could significantly impact project design, cost, and the ultimate feasibility of the project.